The Apollo Series 65 Heat Detector CS is a fixed heat detector with a high temperature range of 80°C to 100°C for use in conventional fire alarm systems. The Apollo Series 65 Heat Class A1R conventional heat detector monitors the rate of rise of the temperature in its environment to identify a fire with a maximum static response of 65°C. The Apollo Series 65 Heat Class BR conventional ROR heat detector will monitor the rate of rise of temperature up to a maximum of 85°C, at which point it automatically trigger an alarm. 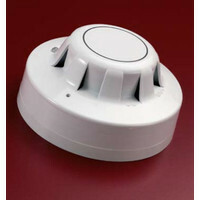 The Apollo Series 65 Heat Detector CR is a rate of rise heat detector with a high temperature range of up to 100°C. Twin thermistors work together to monitor the surrounding air temperature. The Apollo Series 65 Optical Smoke Detector has a external LED for easy identification. 3 consecutive optical smoke detector sensor activations are required to trigger an alarm state. The Apollo Series 65 Ionisation Smoke Detector uses twin compensating chambers and an Americium 241 radioactive source to detect smoke.